About Us | Cec Hanec and Associates Inc.
Cec Hanec & Associates Inc. is dedicated to being a leading resource in innovative performance enhancement solutions and processes, energizing and inspiring businesses, organizations and individuals to be productive and successful. services for companies, organizations and individuals striving for increased success. Cec Hanec & Associates Inc. operates with the utmost integrity and has earned deep trust and credibility in the marketplace and the community. Cec Hanec & Associates Inc. combines innovation, positive thinking, resourcefulness and risk taking with a ‘can do’ attitude that generates enthusiasm, success and opportunities to make things better for clients in various sectors of business, government, not-for-profits and education. Physical activity and wellness is constantly woven throughout all work with individuals and organizations as part of overall performance enhancement. Cec Hanec & Associates launched in 1993 establishing a strong and immediate presence in the marketplace by offering a full menu of consultant, speaker, trainer and personal coaching services focused on communications, presentation skills, customer service, team building, personal marketing and continuous improvement. 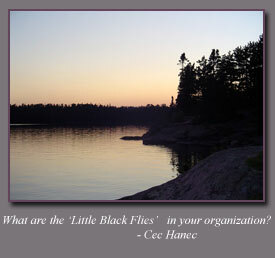 In 1999, building on the solid spectrum of services, Cec Hanec & Associates became an incorporated company and aligned with one of the world’s most respected and validated performance assessment leaders, Target Training Performance Systems International, Ltd., an organization that provides a continuing stream of world wide research findings, innovative tools, comparative case studies and an international knowledge based network. – ideal for companies wanting a seamless approach to enhancing the performance of their people on an international basis. Over the past six years, Cec Hanec as President, Owner, has developed an exceptional expertise in performance assessment, earning Certification as a Behavioral Analyst, Values Analyst, and TriMetrix Job & Talent Benchmark Analyst & Performance DNA – enhancing her reputation as a subject matter expert, spokesperson and leading resource in the field of performance enhancement. Cec continues to be an active learner traveling internationally, several times a year, to learn the latest research applications, connect and share ideas with the best from around the world accessing the latest concepts to share with clients. The result of this unique commitment to “best in class”quality service is an ever increasing client base throughout Manitoba, with majority of clients being repeat customers. In the area of personal business coaching, in particular, Cec has successfully filled a niche in Winnipeg, applying international level training and knowledge to her own experience and expertise base. Significant senior management roles in the YM-YWCA of Winnipeg provided Cec with the opportunity to develop leadership skills, philanthropic attitudes and a global perspective many of the tools she puts to direct work in her values-based personal development style. The Y’s purpose, ‘to help individuals develop a responsibility for self, community and the world, a spirit of volunteerism and respect for all, regardless of race, religion or economic circumstance’ has become Cec’s personal credo. Value Added Associate of: Target Training International, Ltd. Designed by Winnipeg Web Design Company.